Want to buy a miniE shield? More and more people are asking where to buy the miniE shield. Unfortunately there is no place to buy them at the moment but this may change in the near future. 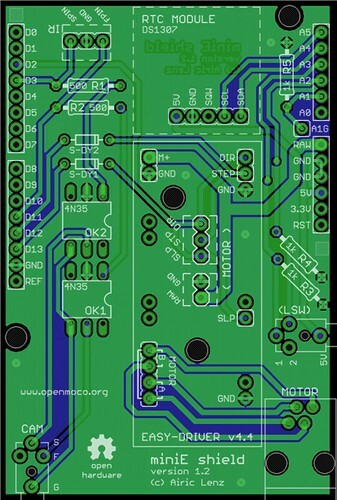 I am wondering how many of you would like to have a nice, high quality shield for placing all the required components (like the Easydriver, required resistors, jacks, …) for a reasonable price (same as a generic Arduino proto-shield but designed especially to serve miniE’s requirements). You can leave your vote in the sidebar. Hej, I fixed some bugs and changed the ramping algorithm – ramping is now much smoother – especially when doing very few steps. I fixed a little but annoying bug in the menu navigation. In some cases one was not able to move away from the main status screen. 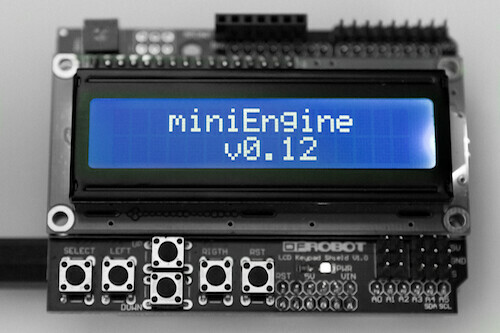 Together with version 0.11 of the miniE software, a new hardware version of the miniE shield was committed. Version 1.2 of the shield introduces a complete rearrangement of the components to avoid contact between the components of the shield and the Arduino as well as with the display shield.